Balkanfolk has released the first independent album of Vocal Folk Group Zornitsa. It is a beautiful collection of Bulgarian authentic folklore songs. Here one can listen to the curious singing in two voices, which is typical for the Western Bulgarian regions. Pii Momche Vino (Drink wine, boy) is the song which gave name of the album. The song itself is arranged for a tapan and the group, and has a very interesting dynamics. 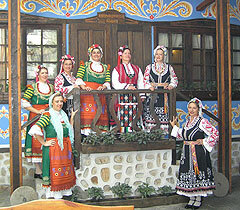 In its establishing in 1997 Zornitsa folk group consisted of 30 singers, men and women. Now it is of 8 women only and may quite properly be called a “women’s choir”. However, the combination and harmony of these women voices produce a performance so beautiful and captivating. During the years the group has performed a great number of concerts in Bulgaria, as well as in Spain, France, Turkey, Greece, Serbia, Macedonia, and Moldova. At many of its international appearances Zornitsa group received praiseworthy awards, but most valuable for its members was the love of the public, which they experienced at everyplace they have been.